"Don't be sad. Are you sad? Don't be sad." Adam Goldberg is probably best known for his scene-stealing turn in Saving Private Ryan, but he burst onto the scene as the equally memorable fast-talking teen in Dazed and Confused. Goldberg is one of the better actors working these days; unfortunately, he's one of those guys you recognize but can't remember his name. 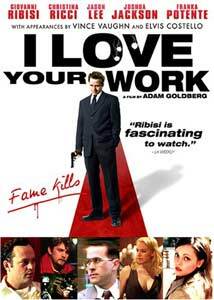 Goldberg recently sat down in the director's chair to helm the 2003 film, I Love Your Work. Unfortunately, despite a run of film festivals, the picture never made a splash in theaters. The story follows Gray Evans (Giovanni Ribisi), a movie star, battling his marriage, the tabloids, and his own head, whose life is beginning to unravel . He is suspicious of his wife, Mia (Franka Potente), who might be having an affair with Elvis Costello, and he fantasizes about a beautiful young mystery woman (Christina Ricci), which adds to his hysteria. While Goldberg has some real potential as a director, his film is simply dull. It's a little too heavy on inside references, making it seem like a messy vanity project. Watching Gray Evans disintegrate is only slightly interesting, as we are constantly interrupted by strange musical interludes, and odd cameos that are never fleshed out. Goldberg relies too much on stylistic tricks, often confusing the viewer with questions of fantasy vs. reality that are rarely answered. Many films pull off such stylish touches, but there is usually some substance behind the style. The score is incredibly annoying, also, and the manner in which the music is instantly switched on and off is a major distraction. The usually reliable Giovanni Ribisi is miscast, and Franka Potente is rather lifeless as his wife. I'm not sure if this relationship is an attempted take on the Tom Cruise/Nicole Kidman marriage, but otherwise, it's hard to believe that these characters, let alone these actors, could ever be a couple. The filmmaker is fighting a losing battle from the beginning, so this doesn't help. Goldberg shows up in his film in a few different ways, but after the first time—a silent, Hitchcockian walk-on (or walk-away in this case)—his presence comes across as unnecessary and distracting. Given Goldberg's wit and excellent sense of humor, it's possible he's doing these things to parody other directors doing the same. Whether this is the case or not, these cameos are out of place. Image Transfer Review: The image begins in 2.35:1, but changes to 1.78:1 after about five minutes. I'm not sure why this change occurred, but it really didn't take anything away from the viewing experience. Image detail and sharpness is strong, for the most part, but there are instances where things soften up and focus is shaky. There is some grain and dirt, as well, but this can be blamed on shoddy source material, and is never too distracting. Audio Transfer Review: There are both Dolby Digital 5.1 and 2.0 audio tracks, with the 5.1 being the track to choose. The 5.1 exhibits much wider dynamic range and makes active use of the surrounds. Both tracks feature a nice bass presence, and excel dialogue clarity. Extras Review: The extras begin with an audio commentary track featuring writer/director Adam Goldberg and star Giovanni Ribisi, and their natural interaction results in a fine track. They talk quite a bit about what it took to make I Love Your Work, but most of the time is spent with the two joking around and just being funny and entertaining. There's a music gallery that contains four separate music cues from the film. Unfortunately, this music, when heard within the film, is very annoying. Separately, like this, does make it much more effective and actually worth listening to. The original trailer for the feature, as well as previews for other TH!NKFilm releases are included. A film that looks great on paper, I Love Your Work can't live up to its fine lineup of actors and quirky director, Adam Goldberg. This overly stylized project doesn't have a script to stand on, and is far too long and drawn out. The DVD rises above the movie and delivers solid audio and video, while including a few decent extras.